The Freedom From Religion Foundation is challenging a Kentucky school district's unabashed endorsement and promotion of prayer. 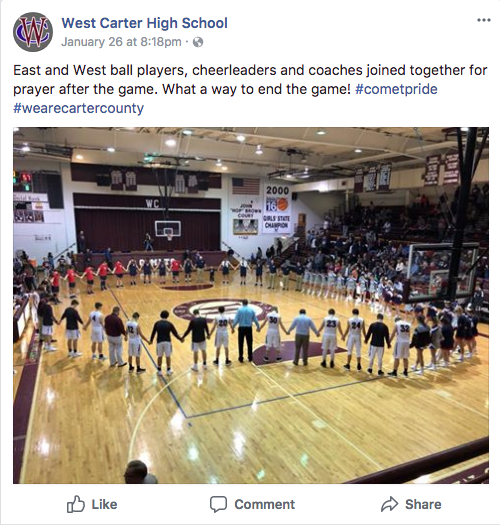 A concerned local resident reported that on Jan. 26, 2017, coaches from East Carter High School and West Carter High School (both part of the Carter County Schools system) joined hands in prayer with their teams and cheerleaders after a basketball game. An image of the two teams praying with their coaches was posted on the West Carter High School official Facebook page with the caption: "East and West ball players, cheerleaders and coaches joined together for prayer after the game. What a way to end the game! #cometpride #wearecartercounty." FFRF is asking Carter County School's employees to cease participating in prayer with students, and for the district's social media pages not to be used to endorse religion. "It is illegal for public school athletic coaches to lead or participate in team prayer," FFRF Legal Fellow Colin McNamara writes to Carter County Schools Superintendent Ronnie Dotson. "The Supreme Court has continually struck down school-sponsored prayer in public schools." Public school coaches must refrain not only from leading prayers themselves, but also from participating in students' prayers, FFRF adds. It is unconstitutional for public school employees to participate in the religious activities of their students. In Borden (2008), the 3rd U.S. Circuit Court of Appeals held the high school football coach's history of organizing, leading and participating in prayers before games was unconstitutional because it violated the Establishment Clause. When a public school employee joins in prayer, the official effectively endorse religion on the district's behalf. The school's social media presence may not be used to promote religion, FFRF contends. "The federal courts have upheld restrictions on the posting of religious materials by government entities because such restrictions exist to avoid an Establishment Clause violation," FFRF states. "The 9th Circuit Court of Appeals has stated that the 'government has a greater interest in controlling what materials are posted on its property than it does in controlling the speech of the people who work for it.'" In Berry v. Department of Social Services (2006), the same appeals court upheld restrictions on displays of religious materials in workspaces, even private cubicles or offices, because public access to the area could cause someone to "reasonably interpret the presence of visible religious items as a government endorsement of religion." These restrictions clearly extend beyond the brick and mortar, FFRF asserts. They are just as applicable to the district's webpage and any social media pages, including those utilized by school employees, which a reasonable viewer would assume represents the views of the school district these employees work for. "Not only is there unembarrassed official participation in prayer, there is blatant promotion of the event, too," remarks FFRF Co-President Dan Barker. "Officials must take immediate action to make all of this stop." The Freedom From Religion Foundation is a national nonprofit organization with more than 30,000 members and 20 chapters across the country, including members in Kentucky and a state chapter. FFRF's purposes are to protect the constitutional separation between state and church, and to educate the public on matters relating to nontheism.